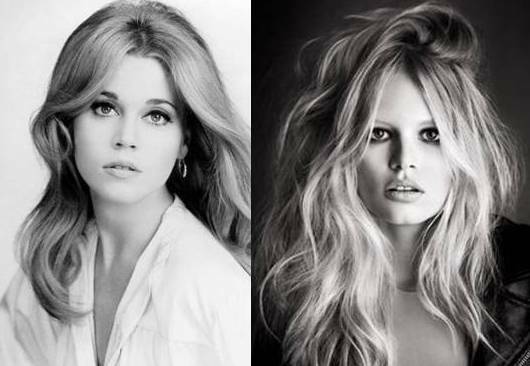 What do Jane and Brigitte have in common? Spring is in the air! That means, well, it's time for another edition of our most popular game. As always, you will be given a pair or trio of films or performers. Your task is to find the common connection. It could be anything--two stars who acted in the same movie, two movies that share a common theme, etc. As always, don't answer all the questions so others can play, too. There is a single best answer for each question. 1. George C. Scott and George Kennedy. 2. The Beverly Hillbillies and Mary Poppins. 3. Brigitte Bardot and Jane Fonda. 4. Jennifer Lopez and Strother Martin. 5. Dennis Weaver and Clint Eastwood. 6. Peter Boyle and Michael Sarrazin. 7. Joe Namath and Marlon Brando. 8. Sidney Poitier and Sandy Dennis. 9. Clint Eastwood and Adrienne Barbeau. 10. Danny Kaye and John Garfield. 11. Don Knotts and Chevy Chase. 12. Bing Crosby and Cornel Wilde. 13. Walt Disney and Gregory Peck. 14. Montgomery Clift, Richard Chamberlain, and Christopher Reeve. 15. Greta Garbo and Cyd Charisse. Thanks for getting this quiz off to fast and accurate start! 14. All three played priests, Clift in I Confess, Chamberlain in The Thorn Birds and Reeve in Monsignor. 15. Charisse played Garbo's role in Silk Stockings, the musical remake of Ninotchka. Terrific job on all three, Jerome! By the way, I think I CONFESS is one of Hitchcock's most underrated pictures. I love the Canadian setting. Yes, indeed! With the notable exceptions of THE COURT JESTER and WHITE CHRISTMAS, I think Danny Kaye was under-utilized in many of his films. THE KID FROM BROOKLYN is pretty funny, though. Wow, that's a great connection that didn't occur to me until you mentioned it. There's actually another answer, too! question 6 ,they both played Frankenstein's Monster in 70's movies, Michael Sarrazin, Frankenstein: The True Story. Well done! I haven't seen THE TRUE STORY in years. I like the scene in THE WILD ONE when someone asks Brando's gang leader what he wants and he replies: "What ya got?" I don't care what anyone says, I find CC more rewatchable than the Wild One. I love the supermarket sandwich scene. Such a 'guy' response! I always have to put my 'male' thinking cap on when I think of responses for your prompts! I meant that Ann-Margret is a great actress...hey, she got two Oscar nominations (though I'm not sure about the one for TOMMY). Great job, Bill! Yes, George played Patton in THE BRASS TARGET. Still needing answers are: 2, 4, 8, 9, 11, 12, and 13. Great job on #4 and that's a connection I missed on 9. There's another one, too. 12, Both in "The Greatest Show on Earth". 8. Teachers with undisciplined students: Sandy Dennis in "up the Down Staircase" and Sidney Poitier in "To Sir With Love". I think both films were released in the same year, too. Nice job on all three! There is another connection for #9. #2 Supporting characters that work in a bank-The Beverly Hillbillies featured Mr. Drysdale while Mary Poppins was employed by (the appropriately-surnamed) George Banks. Very, very good! One of the more difficult questions this time around. 9.Radio hosts in Play Misty, The Fog. Thanks, Bill, for answering a toughie! #13 needs an answer and there's another connection for #12. 12.Knights of Round Table-Connecticut Yankee, Sword of Lancelot. I thought of another one for 9. Escape films - Escape from Alcatraz and Escape From New York. 12. Could also have been Road in pictures --- the Road movies from Crosby and Road House for Wilde. Hey, you're on a streak here! That concludes this month's game. Thanks to all you big brains out there who never miss a question!